Ever get surprised with an out of focus shot? This article is your one stop shopping for everything that affects focus. Choosing focus is deciding what story to tell. Since you should have one main story, there can only be one true subject. Everything else is supporting it. Decide on the true subject and supporting things needs to be in focus for that story. Eyes are the window to the soul. Looking at a picture with unsharp eyes is like trying to talk to a disinterested person. Have you ever tried to talk to someone who isn’t interested and shows it with body language? It’s difficult to look them in the eye. You can tell from that alone that the talk isn’t going to mean much. Get eyes in focus every time. …looking at a picture with unsharp eyes is like trying to talk to a disinterested person. Make sure the distance of things in focus, Depth of Field (DOF), is enough for your subject plus movement. Don’t leave this up to chance. Know these rules by heart and have something handy to give you an exact number in case you need it. This simple iOS app can do it. Sensor size does not affect DOF, explained here. 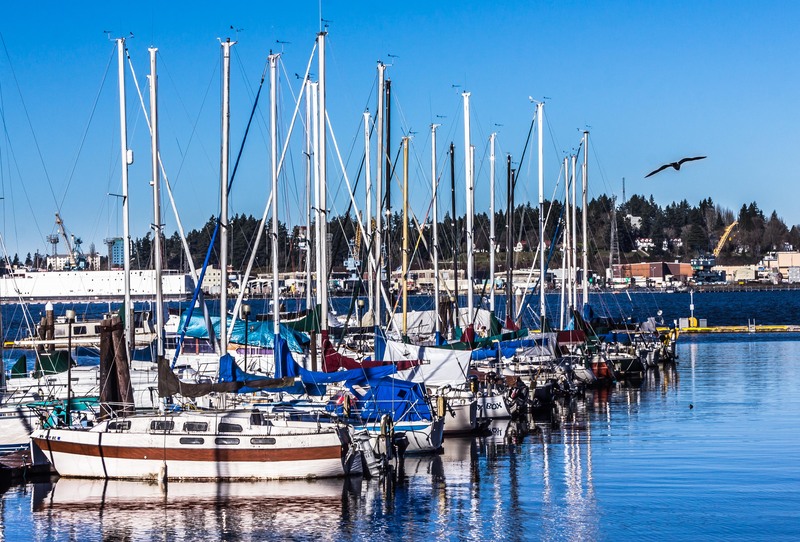 Here’s Port Orchard, WA in focus. One way to remember this is with this mental image. Imagine a pro photographer with his photography vest on, his beret turned sideways, his spider holster holding a second camera. Can you picture him? OK, he wants the flowers right in front of him in focus, the lake in in the distance and the very distant mountain. He gets 50 feet away from the flowers, he gets out his 18-24mm 2.8 lens. He dials it to f/14.0 and 18mm and snaps away. All these things increase the focal depth. Now you have a National Geographic photographer. He blew his Africa plane ticket money at the Apple store so he goes to the zoo to fake it. He chooses his 100mm macro lens, gets real close to the monkey and choose f/2.8. This way the kid with the spiderman shirt on in his background is completely out of focus. I’m sure National Geographic won’t ever know. Subjects move and so do cameras. Shutter speed can be used to create a story of motion. From that decide on your shutter speed, because shutter speed is the main way used to reduce camera and subject motion. Let’s explore some others. No tripod but can’t afford the camera motion? Increase your Depth of Focus (see above for the three things that affect DOF). You could also anticipate where the subject will be and use some reference to get your focus set ahead of time. Use a faster shutter speed. Try moving the camera with the subject. While moving the camera to track side motion is extremely difficult, it also can yield story telling results. If the subject’s motion reverses at a regular interval, like a kid on a swing, you can use the fact that they are momentarily motionless for your benefit. On one apex of the movement get your focus. Then on each subsequent apex snap a shot. You have the option of using a shallower DOF or slower shutter speed if you need to. If shutter speed or the other tricks can’t be used, then give the subject cues for when to hold still. If you have to, give them poses with stability in mind. For example, perpendicular to the camera if it’s a shutter speed issue, or in line with the camera if it’s a focal depth concern. I hope you noticed that this article was mainly a discussion of how shutter speed and aperture can be used for you. Really understanding them helps you make something beautiful where no shot was even possible. That’s how tech meets art. Know of someone else passionate about this photography? Share this article. Want to know when I write more? Subscribe above. Have a comment or question? Let me know and we’ll both grow.